April 24, 2015, 12:34 p.m.
Americans have not been kind when it comes to evaluating the Affordable Care Act – Obamacare. During the awful rollout of the Health Care Exchange in fall 2013, those calling the program a failure were more than triple the percentage saying it was a success. But no more. 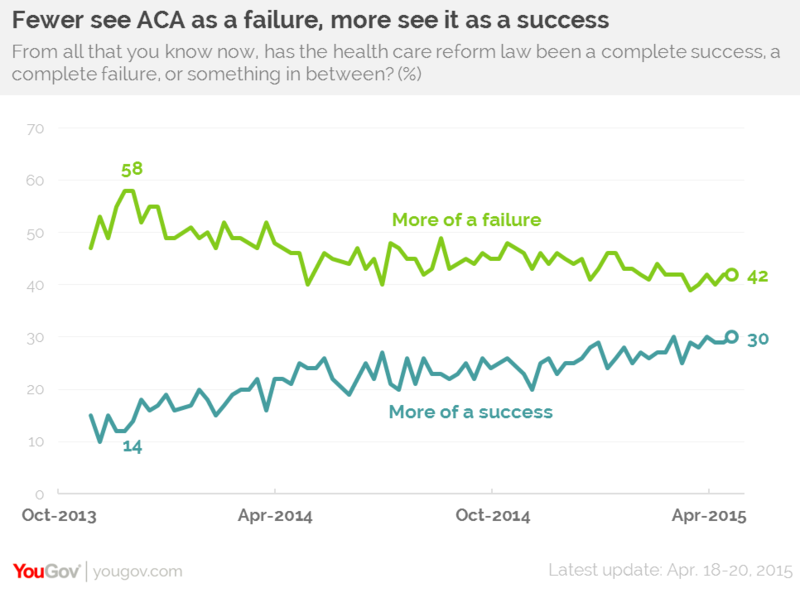 Although more still call the ACA a failure than say it is a success, the margin has narrowed dramatically. In this week’s Economist/YouGov Poll the difference is just 12 points. 42% now say it is a failure, 30% say it is a success. Of course, opinions remain partisan. But one of the changes that has happened over the last few years is that Democrats have become more enthusiastic about Obamacare. In this week’s poll, six in ten Democrats say the ACA has been a success, while only one in ten Democrats call it a failure. Most Americans are no longer calling for the law to be repealed. 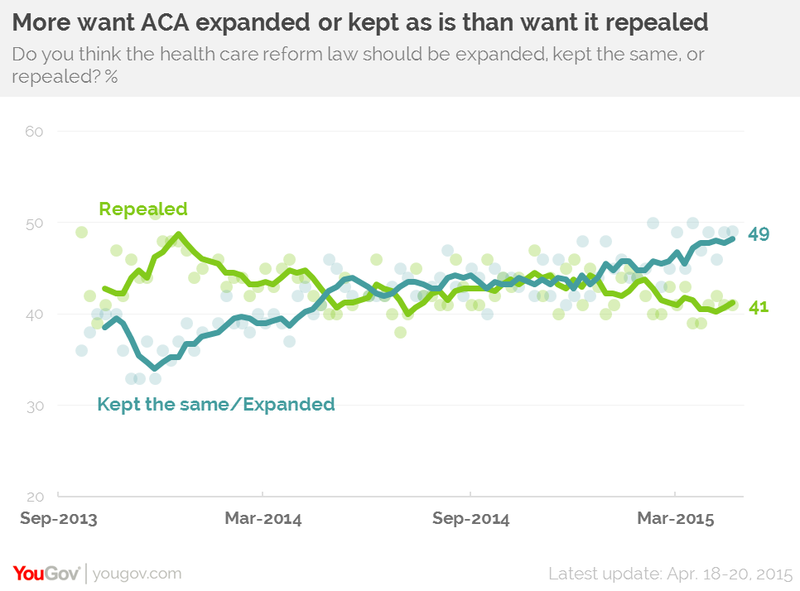 In this week’s poll, 41% would repeal the ACA, but more would keep or expand it. For most of this year this has been the case, with support for expansion or retention outstripping any demand for repeal. More and more Americans are realizing that health coverage has been extended to more people because of the implementation of Obamacare. More have coverage now than say they did for 2013, and this week 61%, among the highest figures ever believe the number of people with health coverage has increased in the last 12 months. 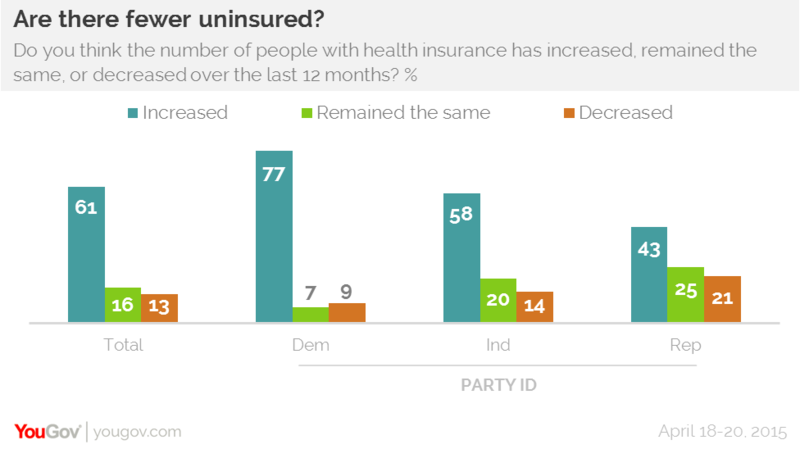 Republicans have been the last group to accept that there has been an increase in coverage: as recently as this January only one in four Republicans thought more people had become covered. Now that percentage has risen to 43%. There is one negative perception: half the public believes that most insurance premiums have risen more because of Obamacare than they would have under ordinary circumstances. The President may finally be getting some credit for his health care plan. 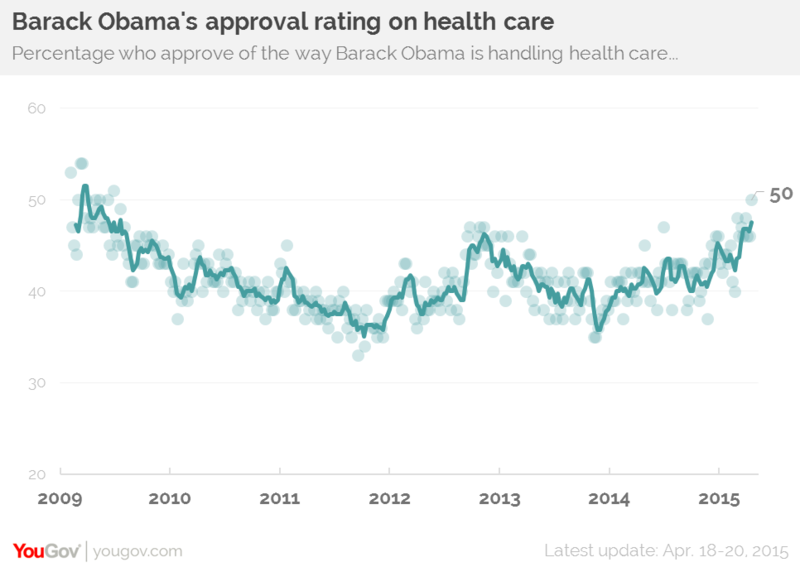 For the first time since 2009, half the public approve of the way Barack Obama is handling health care. While nearly as many disapprove, this week’s rating is the highest in nearly six years. The last time half or more approved of President Obama’s handling of health care was in June 2009. The President’s overall approval rating remains just below 50%. 47% of Americans approve of how he is handling his job overall; 50% don’t.